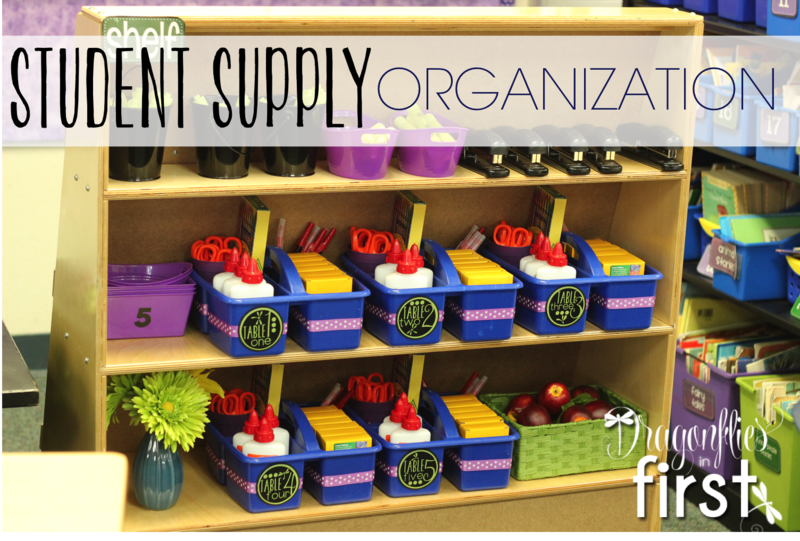 I STRONGLY believe that teachers have more important things to do than worry about organizing student supplies, material storage and clean up. 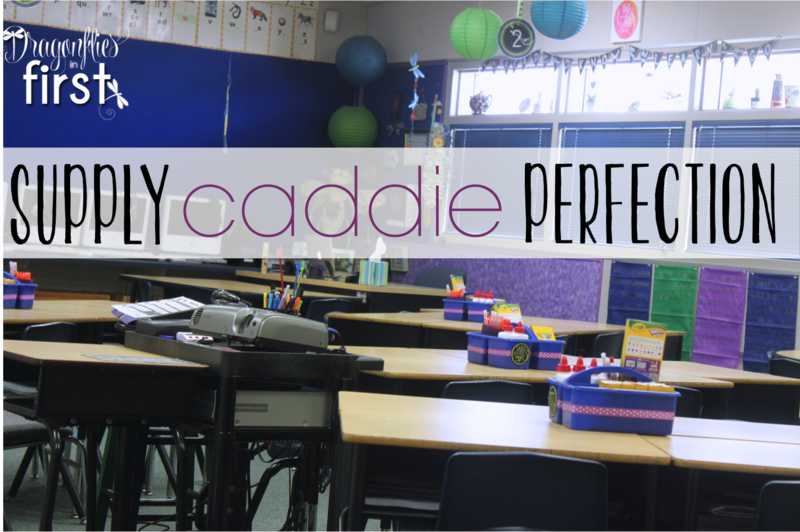 I also believe, strongly, that kiddos are more than capable of running the physical ins and outs of a classroom. Even those little peeps. Independent work? Kiddos manage turning it in and picking up the next assignment on their own in my room. I put out numbered bins for them, and they grab their next assignment. This frees me to work with reading groups without interruption and allows them to spread those independent, confidence building wings. Lost crayon? They know where to find a new one. Found crayon? They know where it goes. 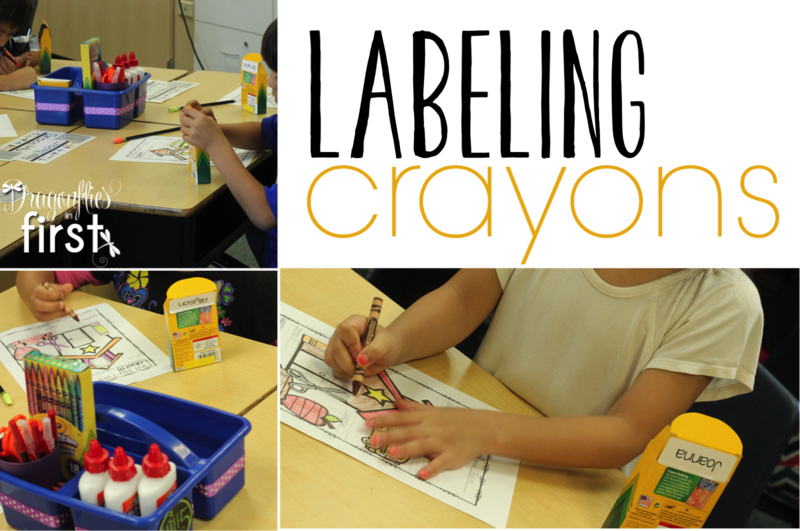 Crayon Cubbies have been such a fabulous help! Need a pencil? Go trade your non-sharpened one for a new one. The pencil sharper – not me – will sharpen pencils for us later. Trash needs to be emptied? No worries, our “janitor” will take care of that for us at the end of the day … allowing our paid custodian more time to vacuum and take care of our room. 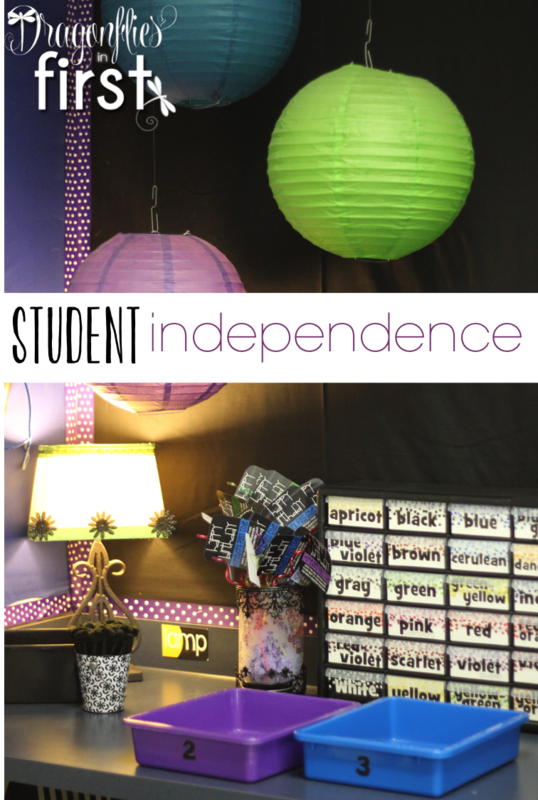 Creating an atmosphere where students know the classroom is theirs, where they take ownership and pride, and, most importantly, where they can do the simple things independently is a huge help in freeing up important time that is far better spent not cleaning up, fetching, or reorganizing. The GREATEST, MOST SPECTACULAR thing I ever did – as I have mentioned 1,354,598,462,320 times is switching from individual pencil boxes to tubs. 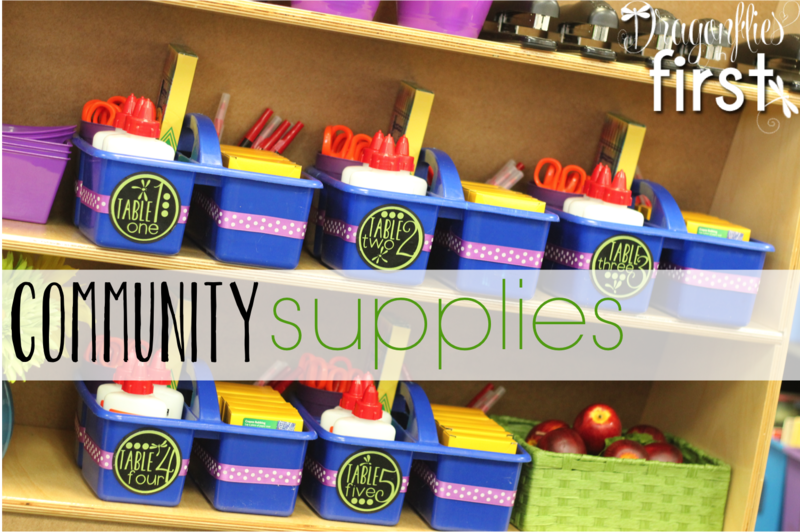 The red pens, erasers (that you can’t see), the scissors and the colored “pencils” – they are really skinny twist up crayons and the kids LOVE THEM – are community property. Inexpensive Glue Bottle or Costly Glue Sticks? Those glue bottles have made me pretty happy, too. 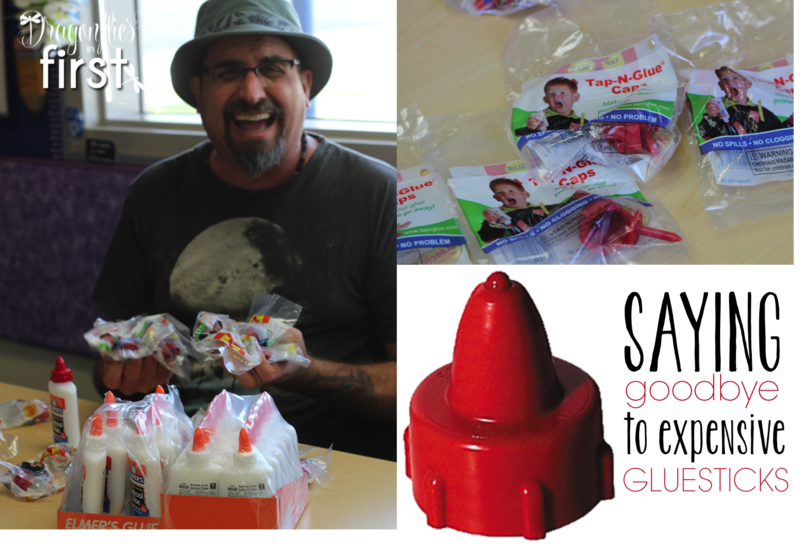 I used to always give the kids glue sticks because glue bottles are just too messy and drive me nuts! But I found the these glue bottle tops that only allow the tiniest dot of glue to come out. They are currently rocking my world!!! They will last forever, unlike the glue sticks, and are not messy at all. Those, too, are community property. My amazing husband helps me out SO much. I gave him the job of switching the caps this summer. Honestly, he didn’t mind. Really. I use address labels to stick their names to the tops of the crayon boxes. When the boxes are closed up and placed in the caddie, their names are on top – making it easy to find a particular crayon box. Tired of the bottom of the crayon boxes dropping out and dumping crayons? Tape it shut! UH.MAZ.ING! I bought yellow duct tape and just put a bit on the bottom of each crayon box. No more worries about wasted time trying to refill a spilled crayon box or re-close a worn out crayon box bottom flap! Hurray! 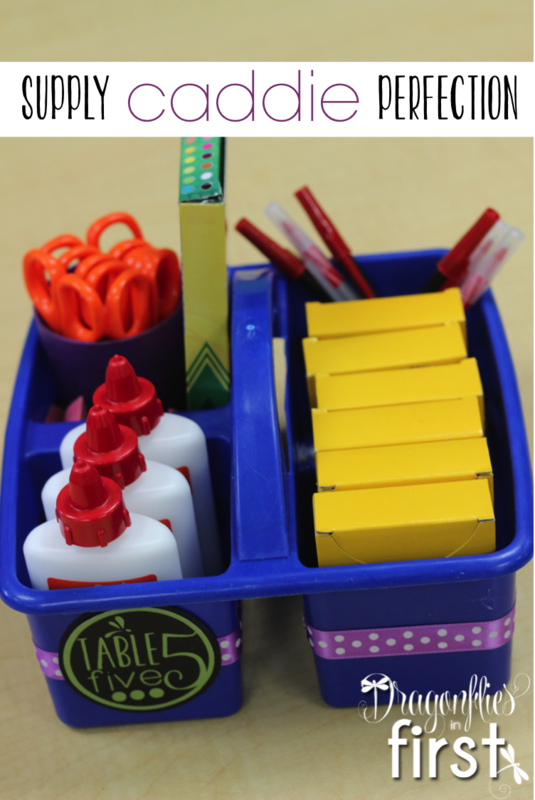 I do not keep my highlighters and white board markers in the table group supply caddies simply because the kiddos are too tempted to play with those pens. Each year I glue (this year my husband did the gluing) a little pom-pom to the caps of the white board markers. These last all year with a little extra instruction and use practice. First I tell the kids to hold the cap part of the pen in their hand nice and tight and protect that little pom-pom like it’s a little baby, then pull the pen out of the cap. We discuss the fragility of pom-poms and glue and that they are MUCH stronger than those things, so they must be RESPONSIBLE and CAREFUL and take gentle care of them. 99% of the kiddos have no problem. I put both the whiteboard markers and the highlighters in numbered containers. The containers match their table number. 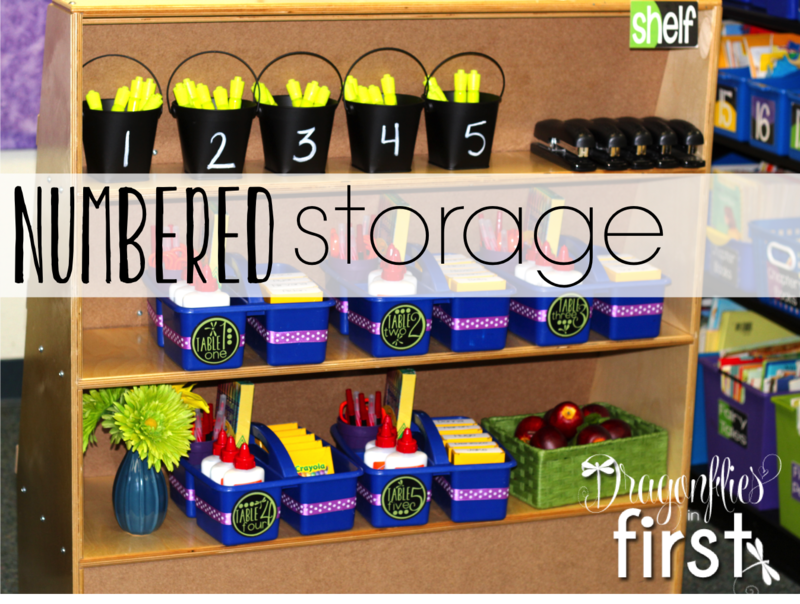 If we need them, one kiddo grabs the tub and that same kiddo puts them away when we are done. I adore these table caddies. I’ve been using them for years. This summer I replaced the ribbon because it was starting to get a little dirty. Since I put it on with hot glue, it was easy to re-do. These tubs keep everything organized and clean. The kids are responsible for them and we set down the rules and expectations right from day one. Those first few days we spend a lot of time double, triple, and quadruple checking that we’ve put everything away correctly. We are two weeks in and the kiddos are experts and have already taken ownership of keeping the tubs absolutely perfectly organized. 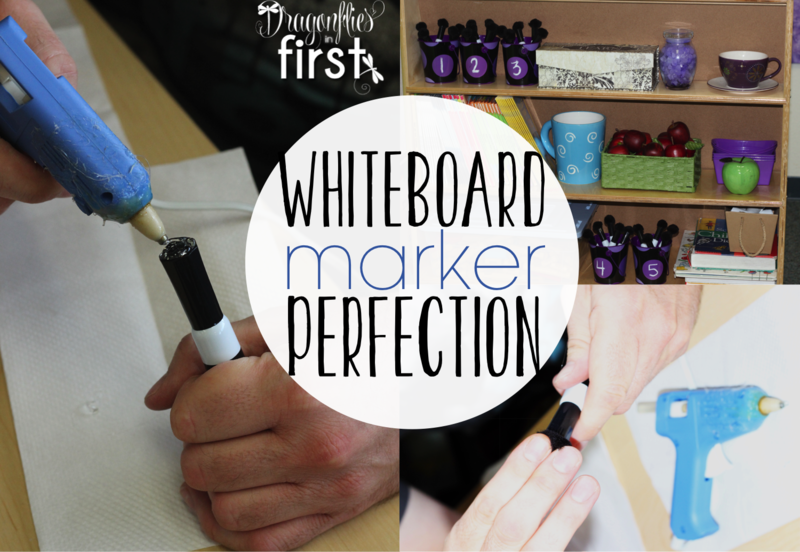 No more pencil box spillage on the floor or trash stuffed inside pencil boxes. No more empty crayon boxes with loose crayons in pencil boxes. If we need desks cleared quickly – we just put the tubs on the shelf. I can’t say enough how happy those tubs make me. I am working with Cricut to promote their new campaign in support of teachers. My Cricut Explore One machine is so much fun. I would tell you that even if I wasn’t an affiliate with them. Seriously, they’ve made some wonderful advancements in their product. 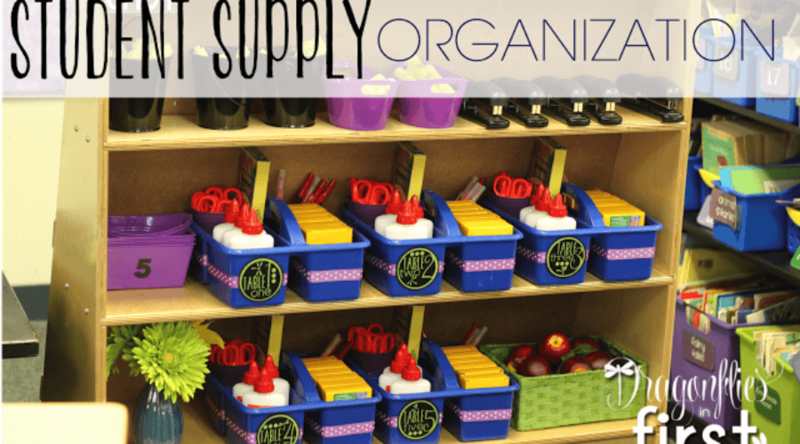 Those ADORABLE labels on my supply tubs were made using my Cricut machine. Peeps! I LOVE this machine! Look how amazing those table number labels look!!! The black part is cut out of heavy-duty “chalkboard vinyl” so they FEEL awesome and are very strong, too. Did you know that Cricut now allows you to use your own fonts and works with a PC or a MAC or even your Smartphone or Tablet??? Well now you do. I couldn’t be more thrilled about that. Being able to design EXACTLY what I want using the fonts that I want is super important to me. 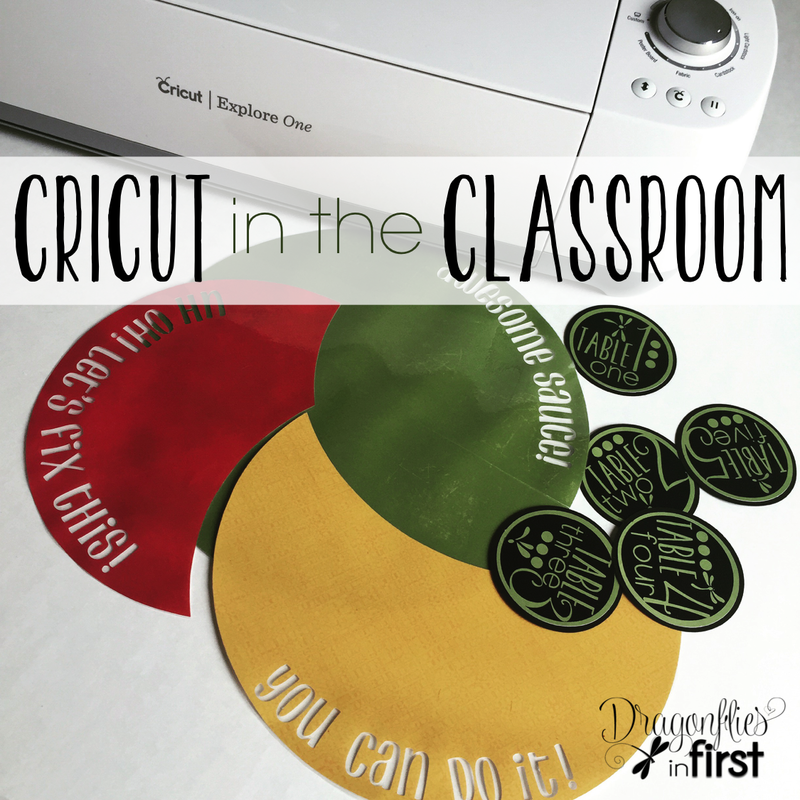 FYI – Cricut‘s giveaway for teachers is ending VERY SOON. IT is a HUGE giveaway contest, you don’t want to miss it! Click the image to enter to win!! ALSO, Cricut is also having a SALE right now! Check out the amazing deal on Cricut Explore Air™ + Ultimate Machine Set and all the fabulous EXTRAS! **Disclaimer – If you purchase a Cricut using my affiliate links provided here, I will receive a small compensation. 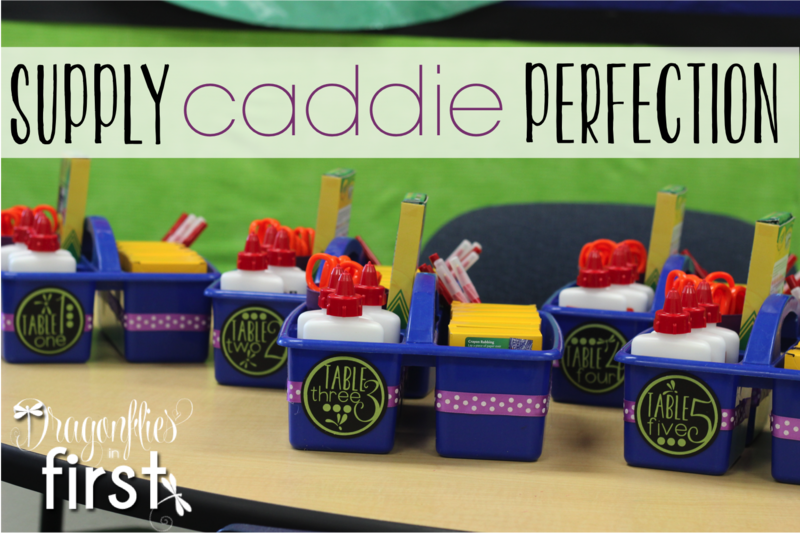 Where did you get your caddies? They look a little bigger than the ones I've seen. Hi Mitzi… It's been a few years, but I'm pretty sure I got them at Target. I have seen them quite a few places, though. Here is an affiliate link to them on Amazon: http://amzn.to/28KRwaA They are also at School Specialties.